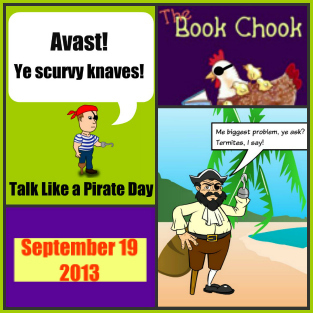 Talk Like a Pirate Day is coming up on September 19. What a great opportunity to have some fun, read and write about pirates, and sneak in a little learning! The last time I celebrated was 2011. Look around your house/classroom and take stock. What can you use to create the "feel" of a pirate ship? If you upturned the dining table, can a sheet make a sail and a tea towel a flag? Is there a corner of the room you can dedicate to pirating, with perhaps a seascape backdrop on the wall and a prow made of cardboard? Only a few props are necessary to set the scene and kids' imaginations will do the rest. Is there something you can use for a plank? If not, outline one with chalk or tape. Costumes are fairly easy. Kids can make their own hats and patches and will have immense fun adding scars and tattoos with face paint. Gold or silver spray paint is great for manufacturing pirate treasure - so are chocolate coins, and they're tastier. If we plan to talk like a (fictional) pirate, we need to know how pirates talk! Listen to some pirate words in the very innocent Captain Pugwash, a lovely animated TV story for kids from the 70s (on Youtube) or grab some vocabulary from A Children's Pirate Shanty. You can even translate your name into Piratespeak. Henceforth, I shall be known as Swashy Pegs! * If you're looking for some fun pirate crafts to do with kids, check out this list of activities on Nurture Store. * There's a very cute pirate paper doll printable at Gwenny Penny and a foldable Captain Cutup at Flippy Faces. * Play with Pirate LEGO. * There is great pirate clip art at Cute Graphics and creator, Laura Strickland, has wonderfully generous terms of service for educators. * Find lots of pirate-themed resources at Early Learning HQ. * Grab some great ideas for pirate party games. * Learn The Pirate Song with Andy Z - a sing along version on Youtube with lyrics on the screen. * Make a piratical avatar or character with BitStrips, and use him/her to tell a story. * Join in with Eric Herman as he sings Blackbeard, Bluebeard and Redbeard - a Pirate Story on Youtube. * Find the Sunken Treasure in this game at National Geographic. * If you're looking for a fun new children's picture book to share with your kids on Talk Like a Pirate Day, check out Florentine and Pig and the Lost Pirate Treasure by Eva Katzler and Jess Mikhail, Bloomsbury (Allen and Unwin) (2013). You might remember I reviewed another Florentine and Pig adventure, Florentine and Pig Have a Very Lovely Picnic last year. This second book in the series features the same concepts of imagination and creativity wrapped in a lively tale and embellished with gorgeous illustrations. Florentine and Pig are stuck in the house on a terribly gloomy day, but they're not gloomy - they're brimming with inspiration for entertaining things to do.Soon they're sailing the high seas of their imaginations in a pirate ship, and it seems that Pig is very, very good at finding hidden treasure.With recipes and a craft activity for families to enjoy together, these books encourage creative play and a love of reading. Join in the fun with Florentine and Pig! When kids have enjoyed the duo's adventures, you can bet they'll be keen to invent some piratical adventures of their own. And after that, when it's time for refreshments, how about Blueberry and Yoghurt Treasure Chest Cakes washed down with Ginger and Honey Hot Choc Grog with Marshmallow Jewels? Pirate food makes pretending to be a pirate even more perfect, and there are other child-friendly recipes to explore in the book too. * Other kinds of pirate food to make: little sausages can be dead men's fingers; find a treasure chest, line it with foil and have cut up fruit in it; decorate iced cup cakes with skull and crossbones cut from licorice. What does your child think pirates ate? Do some research together, and see how authentic you can be. Are you in the USA? Jump Into a Book have a list of 32 Chapter Books about Pirates.